Sometimes the gods smile on us. Sometimes they frown. But right now, they are seriously toying with us! Either that or they have their wires totally tangled. It’s a date and time conflict of unparalleled proportions. On Saturday, February 9th from 2:00 to 4:00 p.m. The Oyster Crackers will be performing in Ilwaco while Cate Gable, Sarah Day and Tony Pfannenstiel will be reading from their recent works of poetry in Ocean Park. Which to attend? An impossible choice! Both events involve friends and creative works near and dear to our hearts. The Oyster Crackers event at the River City Playhouse has been planned for some time. 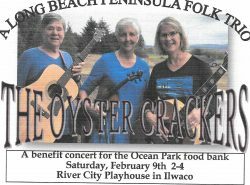 It’s a benefit concert for the Ocean Park Food Bank and the crackers, themselves — Bette Lu Krause, Rita Smith, and Chrystl Mack — have been handing out little flyers about it for over a month. We’ve told them from the get-go that we’d be there. 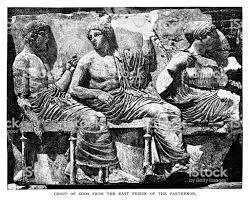 We learned about the poetry reading just the other day. There was an announcement on the bulletin board at Adelaide’s – right beside the Oyster Crackers announcement. I could scarcely believe it! And then, I saw in the Community Calendar in the Observer: OCEAN PARK — An Afternoon with the Peninsula Poets is set for Saturday, Feb. 9, from 2 p.m. to 4 p.m., a poetry reading will be held at the Ocean Park Library. Featured poets are Sarah Day, Cate Gable and Tony Pfannenstiel, with guitar accompaniment by George Coleman. An open mic will begin at 2 p.m. Please feel free to share a poem with the audience. If you have questions call Tony at 503-720-6786. Aaaaugh! I don’t know whether to scream or go deaf! 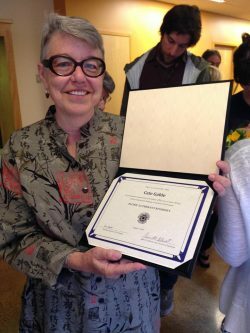 The last time Cate hosted a poetry event on the Peninsula (at least as far as I know), it was at our house in Oysterville and we couldn’t be there. Nyel was in the hospital in Portland for a serious heart-related event and, of course, I was with him. With the help of neighbors Tucker and Carol, the poetry reading – that time with our friend Bob Pyle and with Tod Marshall, then the Poet Laureate of Washington – came off without a hitch. Or so we were told. On the one hand, The Oyster Crackers – friendship, a verbal commitment, a desire to support the food bank vs. we’ve seen them several times already, have hosted them here for a House Concert and have them booked for another next Fall so it’s not like we’d be abandoning them. On the other hand, The Peninsula Poets – friendship, a first-time opportunity (at last!) for us, my own abiding interest in the written word and those who write them vs. a previous commitment and the hope of another opportunity SOON!